We offer you a service from sketch to assembly and everything in between. Tailor-made design for, and in consultation with the customer. Possibilities for special customer requirements. Consult on site about the desired product. Consultation in preparation for the installation. Very high level of education from our very experienced forge. All our products are sandblasted for painting. We can provide your complete building and environment with our forgings, both outside and inside. The strength and durability of our products is unrivaled. Our products are unique and very artistic. Unusual combinations of materials. 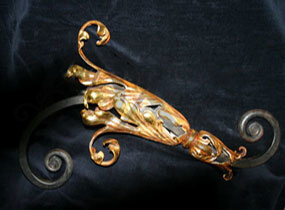 Forged work with stained glass, copper, brass, bronze, wood and natural stone is possible. 2. We would like to receive advice regarding the design of our product. Can we also go to Ox Iron Art for this? Obviously, you can contact us for appropriate advice in the field of styling and design. We will ensure that all your wishes are incorporated in the advice and design of. 3. What information does Ox Iron Art need to make an appropriate offer for us? To begin with, it is important that we have your contact details so that we can contact you. In addition, the golden rule applies, the more information you can give us, the easier it is for us to give good advice. Consider, for example, drawings, sketches of the product, information about the circumstances and location of installation, any photos and impressions of your wishes. In terms of styling, material choice and surface. Development of a design and necessary working drawings. 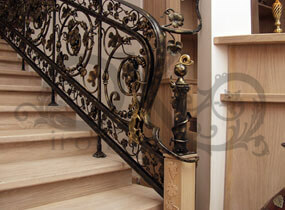 The amount of metal, wrought iron, cast iron and, for example, brass and bronze. Anti-corrosion coatings: primers, primer and finishing paints (possibly hot-dip galvanizing). Decorative finish with eg enamel, patina, gilding. Treatment of the metal: cutting, cutting, stretching, rolling, turning, laser cutting. Molds (often used in the manufacture of straight and spiral stairs). Assembly assembly, cleaning work, painting, finishing. Furthermore, we can explain to you in a personal conversation what we might need more. 5. How much does a square meter of forge cost? Sometimes a customer can not say exactly what he needs exactly, but immediately wants to know how much it costs per meter. Logically it sounds like a fixed average price can be used per square meter. This question can not be answered immediately clearly because the price for each design depends on the complexity of the design and the materials used and all additional costs. We are not out to make the highest profit at the expense of your wallet. Our company is based on its reputation and we will never ask you to order products that do not fit in your interior, and also expensive. An experienced artist will try to prevent you from applying unnecessary frills, and thus make unnecessary costs. 6. If it is possible to order fencing afterwards, and if there is damage to the product after years, Ox can repair it. After delivery we can certainly deliver custom work, fitting pieces or pieces of fencing. 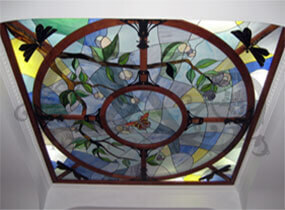 We are also perfectly capable of retrieving lost glory over time and carrying out repairs in places. Do not hesitate to ask your contact person at OX Iron Art about your after sales question. 7. What is the payment procedure? At the start of the project you pay 20% of the budget for making the final design and the working drawings and carrying out the measurements. 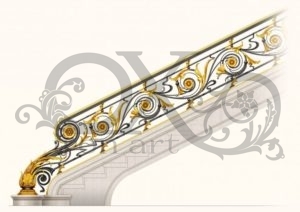 We also make an example for you of the final result immediately after approval of the work design. Then we start production. Depending on the type of work you pay 50% of the budget for the production of products – When the products are ready for shipment you pay 20% of the budget and you are able to see the products before shipment. If we do not carry out the installation ourselves, this percentage is directly the last 30%. After installation by our people you pay the last 10%. The percentages may deviate for long-term projects. 8. How are products treated at Ox against corosion and / or beautifies? All parts that are painted will be carefully treated in advance with corrosion-resistant zinc-rich primers followed by heated drying. Then follows the finish paint – acrylic enamel WS-Plast Standard colors – black, light gray, brown. You can choose among others a standard solid color from the RAL range or go for a more luxurious finish. This finishing consists of a golden, silver, antique bronze or copper color means that the art of applying a patina is applied. If you want a greater corrosion resistance to be applied to the products (especially for outdoor products), we will galvanize the products. Galvanizing is carried out at the factory. The end product is immersed in a bath of floor-stable zinc at a temperature of 450 degrees. After galvanizing the product, it is cleaned from solidified zinc and polished. A primer is applied to the galvanized surfaces. Tikkurila Rostex Super (Finland) after which the wet paint treatment will take place as desired. Lacquered articles are packaged in foil after drying. 9. Is gold leaf also an option like other embellishments? And of course there are techniques that will make it even more beautiful decoration. For example, very impressive looking white ironwork with a golden patina and possibly gold leaf. As well as forging a black patina. Beautiful, fashionable, antique look. There are so many variations possible. But the possibilities are not limited only with paint. 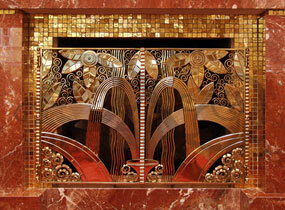 Metal successfully combined with wood and stone, and with non-ferrous metals – brass, bronze. Or with art or glass, mirrors, stained glass, crystals, semi-precious stones, and maybe even something from you. The artist’s imagination is limitless, but it is more important to have artistic design material fit into the interior and the owner is happy with what he sees. 11. What can you expect from us! You receive the product from our company, without the intervention of other intermediaries. There will therefore be no extra costs afterwards. We have experience with artistic old-fashioned forging in the market, who have been working with these products for more than 20 years. We work with our own production and professional artists. We design and manufacture only our own designs. Our contract provides a good guarantee for the product.